Vintage Fiesta mixing bowls and the wider range of collector’s vintage Fiesta dinnerware can bring a splash of vintage color to your dinner table. Perhaps, on reflection, not the Fiesta mixing bowls for your table, but they are certainly colorful because that’s what the line was designed for. However, beware of the colors, because the original and modern colors are different, as are the various pieces currently offered in stores. You get the drift, and so did Homer Laughlin’s customers because the line was very popular from 1936 until its discontinuation in 1973, though it was resurrected in 1986. Originally in red, cobalt blue, green, old ivory and yellow, the set was relatively inexpensive with an art deco design by an Englishman, Frederick Hurten Rhead. Although the onset of World War II did not affect production volume, it had one significant effect. Red pieces suddenly became sought after, and even now red vintage Fiesta pieces fetch higher prices than other colors. Why? Uranium! The red Fiesta dinnerware contained the oxide of a little known (at that time) metal, uranium. The developments of Robert Oppenheimer and his team resulted in all uranium being seized for the development of the atom bomb, and so the red pieces disappeared. Probably fortuitously for the health of the nation! Not only that, but the early glazes contained lead. However, nobody has been recorded as having suffered radiation or lead poisoning by using Fiesta dinnerware. All that apart, vintage Fiesta mixing bowls are currently in great demand because of the difficulty in collecting the full set, including the red – which is actually more of an orange color than a proper red. The Vintage Fiesta mixing bowls were available in sizes ranging from 5 inches in diameter to 11.5 inches – sold as sizes 1 to 7. The ideal set is one of each in each color, nested inside each other, and they were available in red (sometimes called ‘radioactive red’), yellow, green, ivory, cobalt blue and turquoise – six colors compared to the original 5, so 6 bowls, 7 sizes. In fact, sizes 1 and 7 are regarded as valuable, possibly because they are the inside and outside bowls. That may make a difference because it’s quite possible they were the more often used sizes, and therefore harder to find in undamaged condition. The seven sizes nest perfectly, forming a flat surface across the top, and an entire set is what every Fiesta collector dreams of finding, particularly if there are no visible chips once they are nested. Again, likely the reason for a perfect size 1 or 7 being more valuable than those hidden in the body of the nest. If you are unsure how to tell the pedigree of your bowl without the written provenance (distinguishing vintage from modern pieces), the older glazes were full color while the newer ones are more translucent and you can therefore see the pottery underneath them. The ironstone lines were introduced in the 1960’s – before then, the pieces were solid colors. The newer glazes show whitish lines under the glaze and around the rings because it isn’t as opaque or thick as were the originals. The 1936 pieces have rings at the bottom, but apart from that the concentric circles that are characteristic of Fiesta ware reduce in size from being widely spaced at the top to close together at the bottom. Some Fiesta purists bemoan these, but the rings can be used to help distinguish the real thing from fakes, where the rings are often equidistant and do not narrow down. Fiesta dinnerware is a popular collector’s item, with many collectors interested in the vintage (pre-1986) pieces only. Strictly, just as an ‘antique’ is widely considered to be at least 100 years old, a ‘vintage’ piece is largely considered to be at least 50 years old, so Fiesta dinnerware manufactured up to 1959 are technically vintage. But, since production had ceased between 1973 and 1986, then all production until the interregnum from 1973 is considered vintage. Nevertheless, many restrict their collections to 1936 until 1959 when the US government dropped its block on uranium pigments. In spite of all of these dates, most people collect what they like, and collecting vintage Fiesta mixing bowls is popular because many baby-boomers grew up with them, because of their design desirability, the way they fit together and the range of colors in which they were produced. They have less intrinsic value than many other pieces, but are sought after because of the rarity of some of the colors and the fact that a full set involves seven different pieces in 6 different colors – 5 of them the original Fiesta colors. 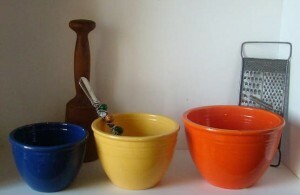 Am looking for an authentic, vintage set of Fiesta Mixing (nesting) bowls. I want the authentic, old ones, all 7.